Sometimes after I enjoy, say, three days of Thanksgiving leftovers (hypothetically speaking) I tend to look for food that will balance the heavy eating. Smoothies and shakes are extremely easy to throw together in minutes, and provide a healthy snack option. They can taste like dessert and act as a filling, nutritious treat at the same time. 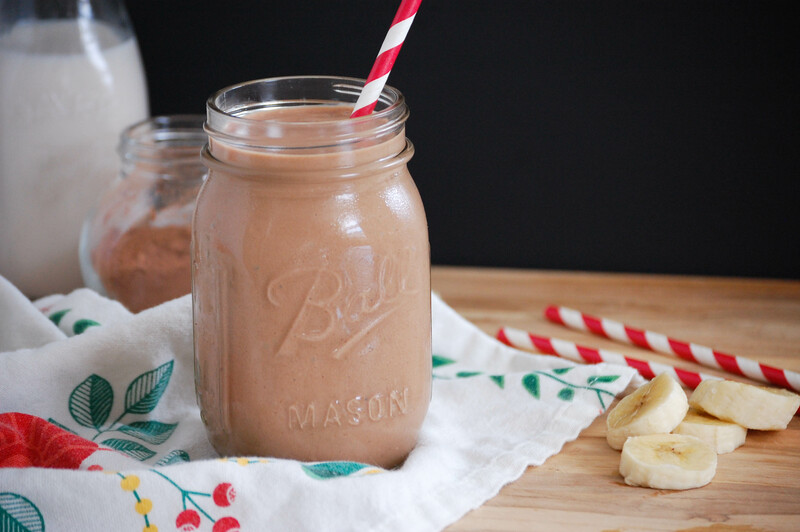 Take this chocolate banana shake for example. Chocolate craving, check. Bananas, a.k.a. another serving of fruit in your day, check. Protein, check. When I make smoothies at home I usually don’t follow an exact recipe. The ingredients in this post are meant more as a guideline than a strict list. Depending on what you like, you can use peanut butter or almond butter, regular milk or almond milk. Personally, I like the extra sweetness that almond butter gives to this particular shake, so that’s what I use. I also no longer drink a lot of dairy—almond milk is what I have in the refrigerator. 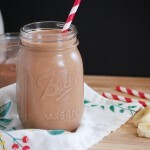 So you can make this smoothie dairy-free if desired, and it is already free of added sugars. Pour in the milk a little at a time, until the smoothie reaches the consistency you would like. The ripeness of the bananas is also a factor to consider. If you are not a huge banana-flavor fan, use barely ripe bananas. 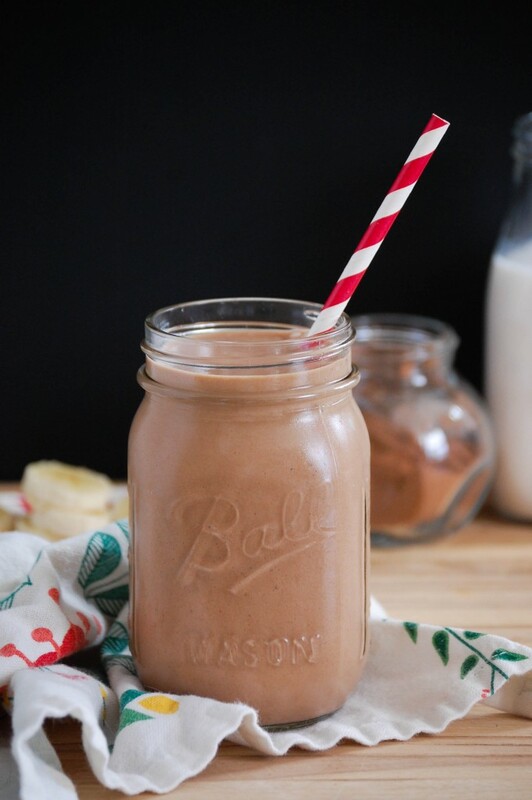 If you want to elevate the banana flavor in the shake, use very ripe bananas—if you’re like me, and bananas tend to go forgotten on the counter for a bit too long, don’t worry! They can still be frozen for smoothies. Just make sure to peel the bananas before freezing. Also, let’s talk about the chia seeds. Yes, as in Ch-Ch-Ch-Chia. You definitely do not need to put them in the recipe. But consider this: they don’t change the flavor (I can’t even tell they’re in the drink) and they add an incredible amount of fiber + Omega-3s + protein. You can find them for a good price at Trader Joe’s and one bag will last awhile. Super foods! This is also a good snack for sharing with the kids. They get a chocolate shake and it’s not even a special occasion! What! It’s also much lighter than drinking an entire ice cream shake, and easier on the stomach. 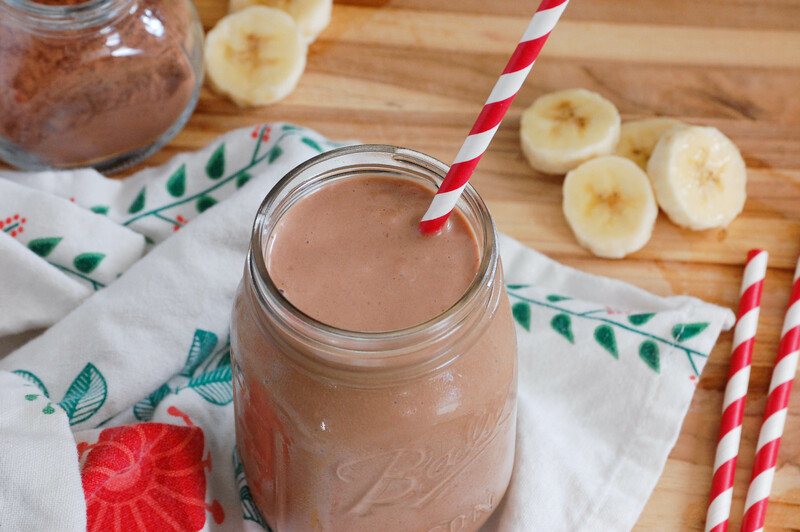 I hope you enjoy this chocolate banana shake as much as I do—for indulging as often as you like. Let me know if you try it! Place all of the ingredients into a blender and process until smooth. Adjust the amount of milk or ice to reach desired consistency. Serve immediately. Can serve 2, depending how much you would like.